Hello! Hope you are all having a good week. 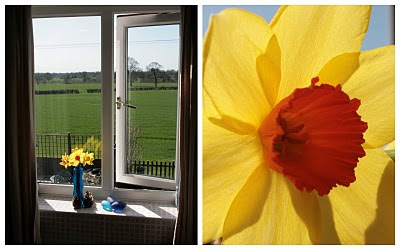 I must admit I cheated on my Happy Easter post as the photo was from last year, so here are this year's daffodils! I'm going to miss our shower and loo with a view when we move! Note the positive, confident when rather than if! It has been a quiet week, a bit of tutoring, online tweaking and general tinkering. With the glorious sunshine and warmth of the last few days I've enjoyed just sitting in the garden and wee danders up the road, being gentle with myself as I've been a bit tense recently. Yesterday evening we saw this hot air balloon out the back window. Last week I went to the Church where my friend and old teaching colleague was doing her training placement and came over all emotional seeing her delivering the sermon. Well done Mrs B! I went back to the same Church on Easter Sunday and received an unexpected chocolate egg with my communion! My lovely sister sent us a big box of chocolate, no I'm sorry I'll have to scrap the alliteration, it was a huge box of chocolate! We went for a run for the first time in ages. Things are growing in the garden. After being left less than impressed by various things I sacked my dentist! Well, I cancelled my next appointment, de-registered from the practice and registered with a new one. And so to the weekend, have a good one!